This product is the premium grade cast film has a high clarity, that makes product identification and bar codes easy to read. It is typically a stiffer film with exceptional load holding force and good puncture resistance, which allows a user to down-gauge, contain aggressive loads and produces a better package at reduced cost. 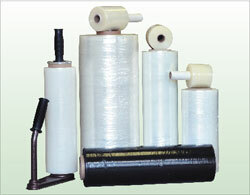 The stretch films are available in hand roll and machine roll, that comes with the different sizes to fit customer's needs.